Here are the steps to Import from TATEMS Fleet Maintenance Software To Quickbooks. Save the spreadsheet but leave it open. Make sure Quickbooks is open using the Quickbooks Company file you want to use. On Import Options Choose your preference “If Already exists” you can choose for example “Skip” to skip importing invoices that have already exist with the same invoice number inside Quickbooks . If all your invoices that you want imported are selected in the list then click the import button and the process will show you the status until it’s completed. As noted above many of these steps only have to be completed one time. If you are current on your TATEMS support and version upgrades and you need any further customization on this spreadsheet that pulls data from TATEMS and I can get it created for you. NEW Install Software Here! And the only one that works with Windows 10!! It will also work with older versions of Windows from Windows XP SP3 and up. This version also works if you have Office 2016 or 2019 installed on your computer. After you download the TATEMSMSI.exe file above, you can just double click on the file to do the install. The software is now signed with our software security certificate by us: PC Help LTD (the video above shows it as unsigned). You will need at least 10 GB of free hard drive space to install and have room for your records. You can either right click on the link above and choose SAVE AS or you can just click on the proper link and when prompted choose “Save”. After you have downloaded you can double click to run the setup. You should normally choose full installation. Either setup may require as many as 3 reboots on older computers depending on what may need to be updated but on modern systems, no reboots are needed. TATEMS runs on Vista /Server 2008/2012/2016 /Win 7 /Win 8 /Win 10 and you can network it even during your free trial period. TATEMS runs on Windows Vista, 7 , 8, 10 and Windows Server 2007, 2013 and 2016. Warning!! Read this entire message before updating!! Especially the Backup Instructions or Watch the Video above!! If you are already running a licensed and registered copy of TATEMS then this release may require you to acquire a new registration number, depending on the version you currently have. This is to prevent any unauthorized access to the new releases after the 1 year (or purchased term) of no-cost version updates has expired. To minimize any inconvenience to you, this release will give you 14 days to acquire the new registration number. If you are in your trial period then the trial period will continue with the same number of days you had remaining before the update. AFTER UPDATE…You will need to submit your serial number(s) along with the version number and your company information or purchase information here so that we can verify eligibility and email the new registration number(s) back to you. Remember, you don't need to apply all previous updates in order to update TATEMS 2005 or TATEMS 20/20 Fleet Maintenance Software. This update will only work with TATEMS Version 3.1.00 or later already installed. You will need to enter the reg key into the local data file as well so keep a copy in case you become unlined from your server if running over a network. You have to update the tatems2005.mde file in each users subfolder. Otherwise, it's the same as in the video above. If you are not familiar with how TATEMS is supposed to be set up on a TS server see the KB article and videos here. Always make sure you make a backup copy of your data before updating. You can just right click on the file and choose copy and then paste it back into the same folder or another folder to create a backup copy. If you go to Tools ->Networking before updating you will be able to see where the data file is located. Write down the path and then use that information after the update to re-link to the data file. VERY IMPORTANT!!!! You should always update TATEMS on every workstation on your network, one after another, not at the exact same time… and don't allow any users to use an old version after an update has been done on any workstation on the network. It will cause data to not update or display properly!! We released a new version 4.4.04b of TATEMS on June 19th 2013. We have released several new versions over the past couple of months starting with version 4.4.03 released on May 3rd 2013. In the 2 minute video below I show you how we have updated the Parts and Labor screens so that you will see what data you missed if you did not fill everything in. 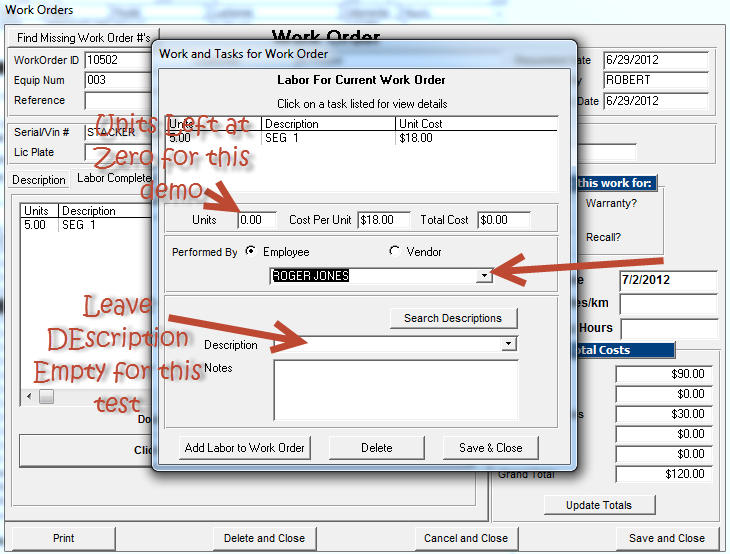 If you click OK you will be able to go back and correct the entry, if you click cancel after clicking on the Add Labor you will be taken back to the Labor for Current Work Order Screen with and the data you previously entered will still be there. 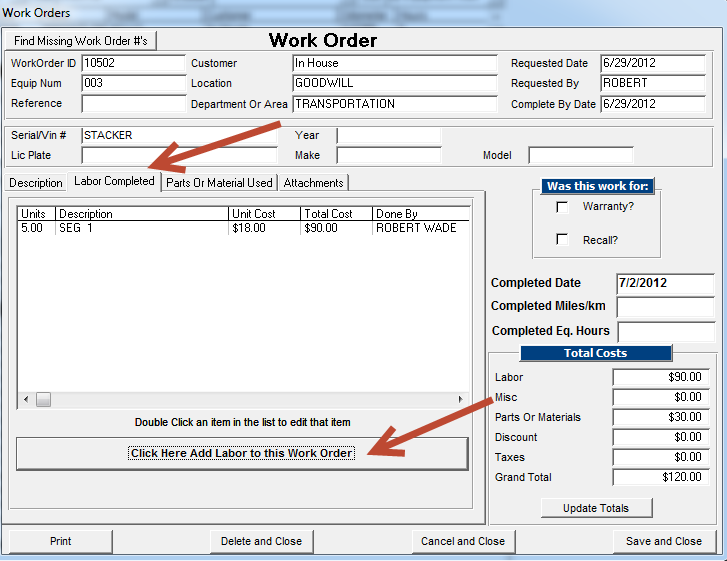 If you click cancel after clicking Add Labor To Work Order you will be brought back to the Labor for Current Work Order Screen but all your data will be removed and you can start over. If you click OK after you click the Save & Close button then you will likewise be brought back to the Labor for Current Work Order screen to correct your mistake. 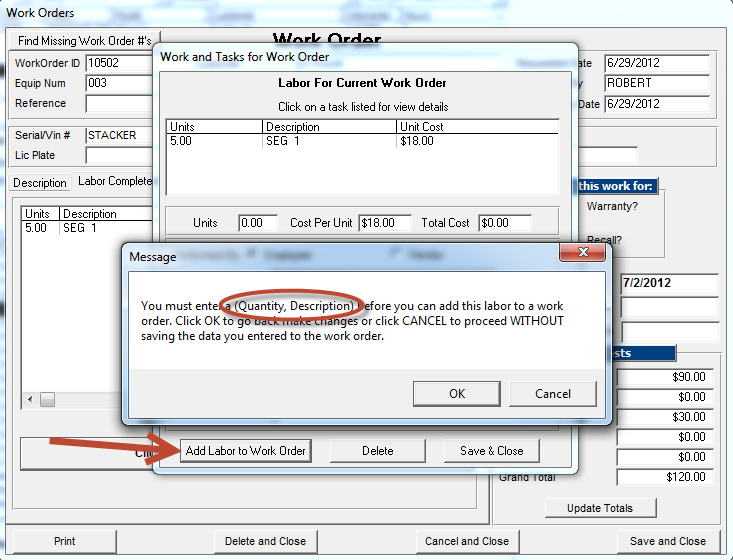 But if you click the Cancel button after clicking Save & Close the data will not be saved and the Labor For Current Work Order screen will simply close. I hope this feature is helpful for you.